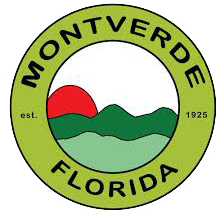 The Montverde Town Council consists of 5 locally elected residents that work with the Mayor to govern the town. They publicly meet in the Town Hall every second Tuesday of the month at 7pm. This booklet has been prepared for the convenience of the Montverde Town Council In discussing matters before them. Every effort has been made to include all items to be discussed at this Town Council Meeting, however, the Mayor or Council Members may add items, which are not part of this Agenda, or items may be removed from consideration. While it has been the goal to present error-free information, we do not represent that documentation is without errors or omissions. In addition to regular Council Meetings, the Mayor or Town Council may, from time to time, schedule a workshop during which they will receive information from Staff, have discussions with Staff and among themselves, and then proceed to give Staff direction on the subject matter being discussed unless otherwise shows on the Agenda item. These discussions and workshops do not take the place of the formal public hearing process during which any member of the public may comment and formal action is taken. At this point in the meeting, the Town Council will hear questions, comments and concerns from the citizens of Montverde. Action will not be taken by the Council at this meeting, but questions may be answered by Staff or issues may be referred for appropriate Staff action. If further action is necessary, the item may be placed on a future agenda for further review and consideration. IF YOU WISH TO SPEAK DURING THIS PERIOD, YOU MUST DO SO FROM THE PODIUM AND COMPLETE A SPEAKER REQUEST CARD. NOTE: Matters on this agendas or which may be coming before the Council at a later date will not be discussed until such time as they come before the Council in a public hearing. The Town Council reserves the right to move any Agenda item to an earlier time during the meeting as its schedule permits, except in the case of the items and appointments that have been advertised in a newspaper for a specific time. Pursuant to the provisions of Chapter 286 Florida Statutes, Section 286.0105, if a person decides to appeal any decision made by the Town Council with respect to any matter considered at this Council meeting, he or she will need a record of the proceedings, and that, for such purpose, he or she may need to ensure that a verbatim record of the proceedings is made, which record may include the testimony and evidence upon which the appeal is to be based. Persons with disabilities needed assistance to participate in any of these proceedings should contact Town Hall at (407) 469-2681, 48 hours in advance of the scheduled meeting. Committee Reports – Visioning, Parks & Recreation, Cemetery, Public Safety, Historical and Library are welcome to report. Request for Conditional Use Permit Application at 16947 Lakeside Drive, Parcel # 1462479 to conduct a painting/coating process for firearms. Resolution 2019-003, Granting a Conditional Use Permit in a C-1 Commercial Zoning District to allow for the customizing of firearms for the property located at 16947 Lakeside Drive, Town of Montverde, Florida owned by the Robert D. & Elaine F. Mastin Revocable Trust dated August 31, 2007. Request to vacate Right-Of-Way of the Division St. ROW.